Brandon Weeden is 0-3 as the replacement starter for Tony Romo, but may not be the starting QB after Dallas reshuffles the deck during the bye week. As magical as the Brandon Weeden Experience must be for the Dallas Cowboys, it’s probably time for something new and head coach Jason Garrett knows it. After a 30-6 demolishing at the hands of the New England Patriots on Sunday in which Weeden threw for just 188 yards on zero touchdowns and one interception, Garrett said that he would consider making a change at quarterback during the Cowboys’ Week 6 bye, per Clarence Hill of the Fort Worth Star-Telegram. 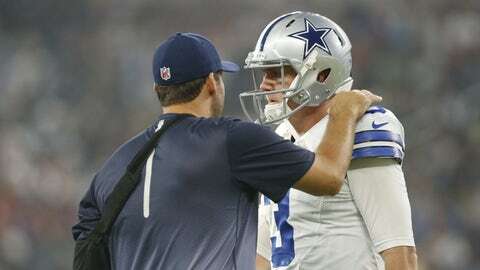 Weeden is 0-3 ever since taking over as the Cowboys starter for an injured Tony Romo. In those three games, he has posted a mediocre 85.7 quarterback rating and thrown for just one touchdown as opposed to two interceptions. Dallas has both former Boise State signal caller Kellen Moore and the recently-acquired Matt Cassel on the depth chart behind Weeden. Bleacher Report NFL Insider Jason Cole reported on Monday that it is “highly likely” Cassel is named the starter for Week 7 against the New York Giants. Cassel was a nightmare under center for the Vikings last season and hasn’t looked like a viable NFL starter in quite some time now. But given how underwhelming Weeden has been ever since Romo went down, the only option left for the Cowboys until Romo and Dez Bryant return seems to be praying that a breath of fresh air provides some answers for this floundering offense. Oh and that crow is probably going to taste real good for owner Jerry Jones.